A skinny person could probably get through this gap under the airport fence. Taking advantage of Friday afternoon’s sunshine, I took a second look at the new quarter-million-dollar fence at Albany Municipal Airport, another step in the fencing of America. The fence, 8 feet tall including the strands of barbed wire on top, runs mostly on the east side of the airport bordering Price Road and Timber-Linn Park. The city says it was put up at the behest of the Federal Aviation Administration, which paid for most of the cost with a grant. Because it looks forbidding right along a sidewalk on the west side of Price Road, Mayor Sharon Konopa thinks it is out of place. In a piece published on Dec. 23, 2013, I thought so too. And looking at the completed job Friday did not change my mind. The fencing of America accelerated after 9/11. 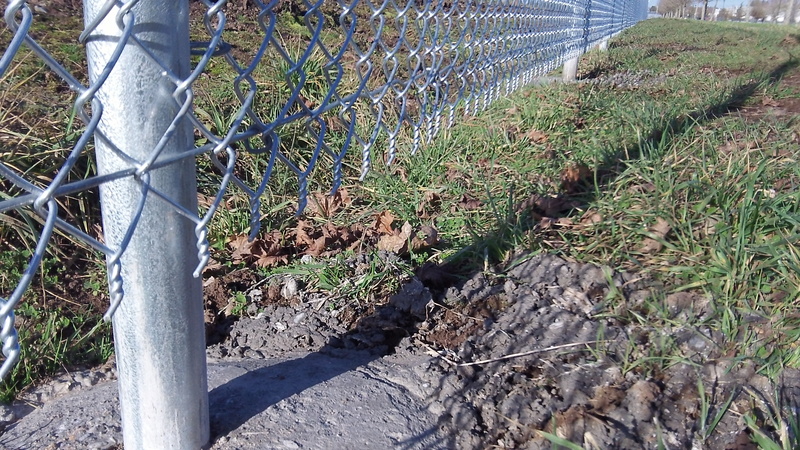 In Albany we’ve seen chain-link wire go up around federal installations such as the research lab on Queen Avenue and local facilities such as the Vine Street water treatment plant. Shhhh. Hasso, if you keep pointing this out the flaws they’ll only have to rebuild it… at taxpayer expense.